This 2010 Sealine SC35 is powered by two Volvo Penta D4 260hp diesel engines with only 410 engine hours. She is fitted with a Duoprop star drive. 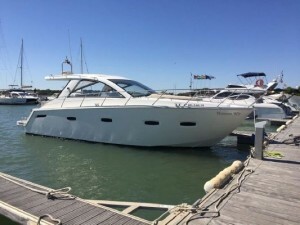 This Sealine SC35 also benefits from a bow thruster and air conditioning. Accommodation for 5 is provided on board this Sealine SC35. The forward owners cabin features a centreline double berth, with a large hanging wardrobe and double doors opening into the saloon. The aft cabin features three further single guest berths, two of which can also convert to form a double. There is a spacious bathroom aft of the owner cabin which benefits from a full standing height shower compartment. The open plan saloon and galley area of this Sealine SC35 benefits from a large overhead skylights. The saloon features an L-shaped seating area with removable table for dining. Opposite is a compact galley which is equipped with a sink, stove and oven, and a refrigerator. The deck of this Sealine 35 is laid in teak throughout. The cockpit offers plentiful space for entertaining with various soft seating areas and a cockpit table. The cockpit has a convertible roof which offers protection from the elements when required. There is a helm station raised to starboard with a double helm seat, and to aft is a large bathing platform with bathing ladder.